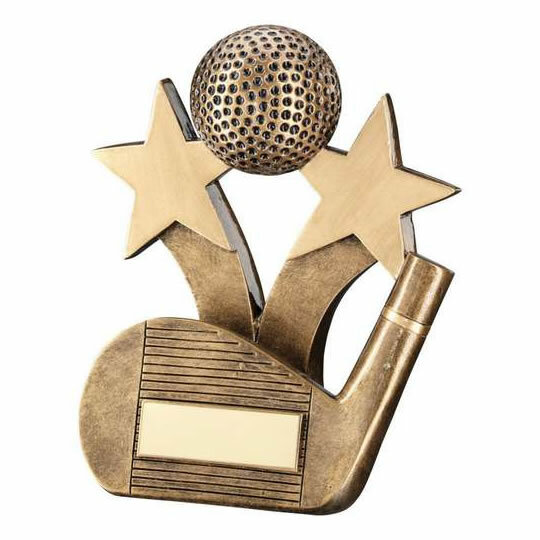 These golf wedge club trophies are perfect to recognise and reward a chip shot, bunker shot or other golf approach shot achievements. Crafted in resin with an attractive bronze and gold colour finish, they feature a full 3D ball set between two stars shooting from a wedge club head. Standing 5.5in (140mm) tall, these golf wedge trophies include an engraving plate and are offered with low-cost engraving.